I made homemade jam again, this time, it is Banana & Passion Fruit jam. I bought these passion fruits many weeks ago...this variety is golden-yellow with small white speckles on the skin, before the fruits were riped. I left them at room temperature, and they took weeks before they started to look 'old'...developing wrinkles and dimples on the skin. Over the weeks, the colour gradually changed to a darker shade of red. I was told that they have to turn into a deep purple (just like a mangosteen) before they are considered fully ripened. I tasted one unripe fruit the very next day I bought them...the amount of pulp and juice in the fruit was miserable. The fruit was quite 'empty', I was only able to scoop out 2 tiny teaspoons of pulp, and it tasted very sour. I waited for almost 3 weeks...it was a torture having to check on them everyday!...and even though the skin had yet to turn purple, I cut out one fruit to try. There were more pulps and juice this time, and it didn't tasted that sour, although it is still a little tangy. The pulp smells wonderful...that's probably why this highly aromatic fruit is also known as "百香果" in Chinese (I'll like to translate it as '100-fragrance-fruit'). 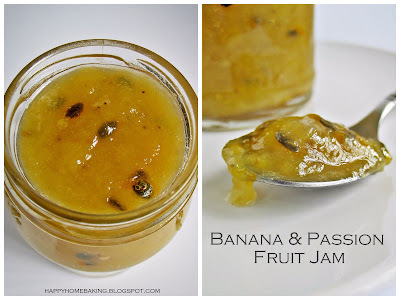 I didn't wait any longer and used two fruits to make this Banana & Passion Fruit jam. Other than the little extra effort required to sterilise the jam bottles, this jam is super easy to make. There are just 3 ingredients...bananas, passion fruit and sugar. The original recipe calls for slicing the bananas into 1mm thick slices...but I did it my way...simply mashed up the bananas with a fork. I mashed the bananas really well...almost like a puree, I want the finished jam to be very smooth with no chunks of bananas in it. Cooking the jam took less than 5 mins...about 2 mins to bring the mixture to a rolling boil and another 2~ 3 mins of boiling until the jam turned clear, and it was done. Once again, this recipe doesn't call for pectin, as the bananas would act as a natural pectin to set the jam. When it is still hot, the consistency of the jam will be quite runny or pourable...but it will set nicely when it cools off. Although this jam has got more banana than passion fruit...the presence of the passion fruit is quite dominant. It is a very delicious jam and the seeds give a very nice crunch to it. This jam doesn't taste that sweet...I believe it is largely due to the slightly tangy passion fruit. It is yummy on a slice of plain toast...and I may use this jam to make a batch of muffins, or a chiffon cake soon. Place finely mashed bananas, passion fruit pulp and sugar in a pot or a large saucepan. Mix well. Keep at a rolling boil for another 2 ~ 3 mins, stirring constantly till the mixture thickens, becomes clearer and transparent (no more foams). Ladle hot jam into hot sterilised jars leaving a gap of about 1~2cm from the top. (Since I do not have an appropriate ladle or funnel, I poured the jam into my measuring cup before filling the jars. The sprout on the cup helps easy and clean filling.) Secure lids. Let cool. Unopened jam will keep up to 3 months if stored in fridge or in a cool, dark cupboard. Once opened, store in fridge and best consumed within a week**. *Do not reduce the sugar, as the amount is required to preserve the jam. **According to the original recipe book, once opened, store the jam in fridge and best consumed withint 1 week. I didn't have any problem with my homemade jam after 3~4 weeks. However, for safe eating practices, do examine the jam frequently for signs of spoilage. I like passionfrut! The jam looks very good. Wow! Your jam looked really very pretty! I love the seeds of the passionfruits. I didn't know that passionfruits can be kept for so long outside! Even as it ripen, the colour of the passionfruit looked very pretty too! It's a really good jam to be kept for baking too! Thanks for sharing! This must be the most easiest and most satisfying jam recipes I have come across. And the beauty is it needs such a short time to get such lovely jam .. thanks HHB! You are the best! Your jam is so.... tempting and can't resist trying out. May I know which type of bananas should I use. wow! Another homemade fruit jam! This is my first time know about passion fruit jam. The color very pretty and special. There is no reason to buy jam from supermarket anymore. Good job! 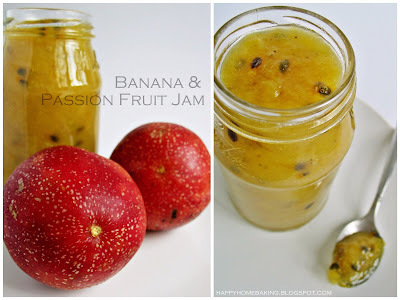 You're passionfruit jam looks so nice! Just like those I saw from the malaysia desaru fruit farm, they're selling this kind of jam as well! May I know why is there a need to sterilise the bottles? I wanna try making my own jam too.. But too lazy to go tru the process of sterilising.. If only I can skip that... How nice would it be! Thanks for sharing this recipe. Time to stop buying jam huh? I LOVE passionfruit. Looking forward to read how you use the jam. Hi HMM....where u bought the passionfruit? the colour looks so vibrant! Hi Passionate About Baking, yes, I like the seeds too! Thanks Anonymous, you can use any type of bananas, as long as they are very riped...with black speckles on the skin. 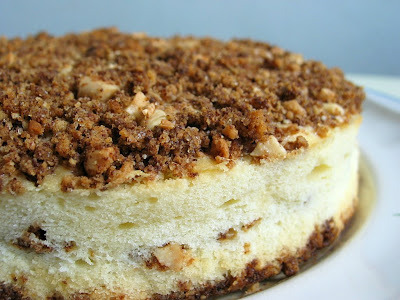 For this recipe, I used the smaller bananas (not those Del Monte ones). Hi Carrie, you need to sterilise the bottles as there is no preservatives used in homemade jam. Properly sterilised bottles will help preserve the jam longer. Hi Peng, I bought the passion fruits from the fruit stalls.They are also available at at ntuc. For as much as I love passion fruit flavor, I've never bought a passion fruit. I think I might now. You've really inspired me! Hello!!!! XD Mind if i ask whether you know of any recipe of easter candy like dipping strawberries into melted chocolate and decorating them. (Of course they teach how to decorate as well)? Passionfruit is also known as 熱情果！！！ Such a passionate name, yes? :) Lately, me and husband are very fond of this passion fruit. Sweet and juicy! I have stored a lot and also wondering if I can bake something out of it! Thought of making passion fruit souffle, but the recipe calls for half a dozen of eggs! Hi Tasmin, I am afraid I do not know of such recipes...I have not tried decorating strawberries with chocolate. Maybe you can try google for it. I am sure you can find something suitable. vb, yes, besides 热情果 is it also known as 西番莲果, and 热情 (passion) is actually a wrong translation, as 'passion fruit is named because of the unqiue structure of the flower...the different parts of the flower resemble different symbols of Christ's crucifixion, eg the flower's filaments represent the Crown of Thorns.' It is also known as 时钟果(clock-fruit!) because the shape of the flower looks like a clock face...and in Japan it is known as 時計草(clock plant). Btw, I'm holding two giveaways on my blog, so feel free to join in the fun! What a lovely recipe. I've made my own jam once before, and it was delicious. So much better than what you can buy in the grocery store. Definitely worth the effort. Lovely recipe--I bet the tart of the passion fruit balances the sweet banana nicely. Beautiful color, too! Lovely recipe you have here - and great blog too. HI, I chanced upon your blog just now and I spend 3 hours looking at all the entries! I really want to thank you for all the wonderful recipes and professional looking photos. Best of all, your 'eay-to assemble layered cakes' have inspired me to bake my hubby a birthday cake cos its his birthday in 2 days time. I have a bottle of bitter-cut lemon marmalade jam bought quite some time back and don't quite like it. It has chunky pieces of lemon. Do you think I can use that to make a chiffon cake using your banana blueberry recipe? I think you can give it a try using the banana blueberry chiffon recipe...however, I have some reservations...since you don't really like the jam (is it too sweet? too tang? ), I am not sure whether you will like the finished cake? I rather advise you to try it with jams that you like...if not you can try it with muffins (easier to bake!) to see whether you like the taste? Hi Kym Kym, thanks for dropping by :) Besides the Everyday bread, I would like to recommend you to try the Crunchy Peanut Butter Bread...I have received several good reviews on this recipe. Have fun making your own bread! Thanks HHB! Maybe I'll try the chiffon if i have time. The jam was a gift from someone but the reason I don't like using the jam is not because of the taste, but because I don't often spread jam on bread as I can't resist spreading peanut butter on my bread everyday! I tried to use the Passion Fruit to bake a chiffon this morning for breakfast. Ya, its yummy and the 100 fragrance really filled up every kitchen corner. I have no ideas when it comes to baking a birthday cake for a baby! It will be very challenging indeed! Maybe you want to try making a sponge cake, and decorate it with whipped cream? To make a passionfruit chiffon, which chiffon recipe should i adapt?So far, i have only tried passionfruit with cheesecake.It was soooo sour!after reading yr blog,it seems that this should nt be the case if the fruit is ripe! I made the jam yesterday, the colour turns out dark and it is far too sweet. In fact, I reduce the sugar amt. However, when I spread it to the bread, it tastes ok.
Hi, the dark colour could be due to the banana turned brown after you mashed it up. May I ask whether you leave the mashed banana aside for too long? Once you mash the banana mixed it right away with the other ingredients and cook it immediately. It is not advisable to reduce the sugar amount as you need the amount to preserve the jam. It looks pretty tasty, although passion fruit is kind of hard to come by where I live. I blur blur bought some passion fruit today at NTUC but they're in Golden brown and unripe yet...sign..better wait till ripe to make this Jam..can't wait to taste it.. Thank you for such an easy to follow recipe for jam! This looks fantastic. I love passion fruit.. it's my favorite. I bet this jam is to die for! may i know where to buy the glass jar? Thanks. Hi, I didnt buy the glass jars, they are empty jam jars which I have been keeping. I was wondering what to do with these passion fruit I picked and found your recipe so made the jam. It is delicious. I used banana from my freezer, which made the jam a bit darker than your picture but we don't mind it's the taste that counts and next time I make it it will be a nice and golden colour. Thanks. I am now going to check out your banana recipes. I'm not sure if it works the same way for Passion Fruit as it does for other fruits -- but you could try putting the unripened fruit in a paper bag. I guess as the fruits "decompose" they let off a gas that ripens them when in the enclosed bag. Hi, may i use this photo for a food stall signage? Hi, thanks for asking, but I am sorry I don't think my photos are good enough, you may try look for other photos from other sources.